In April 2017 the ins and outs of EU Regulation 2016/1628 have been well explained by a consortium led by Euromot. 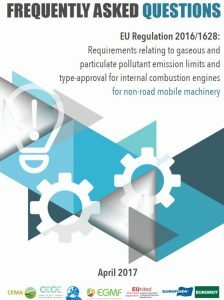 This Regulation draws requirements relating to gaseous and particulate pollutant emission limits and type-approval for internal combustion engines for non-road mobile machinery, amongst which are IWT engines. Follow this link to examine the NRMM Guide (or click on the picture). Currently the members and partners of the EIBIP platform are elaborating upon a dedicated guide for IWT stakeholders. Topics to be adressed can be mentioned in the form below.